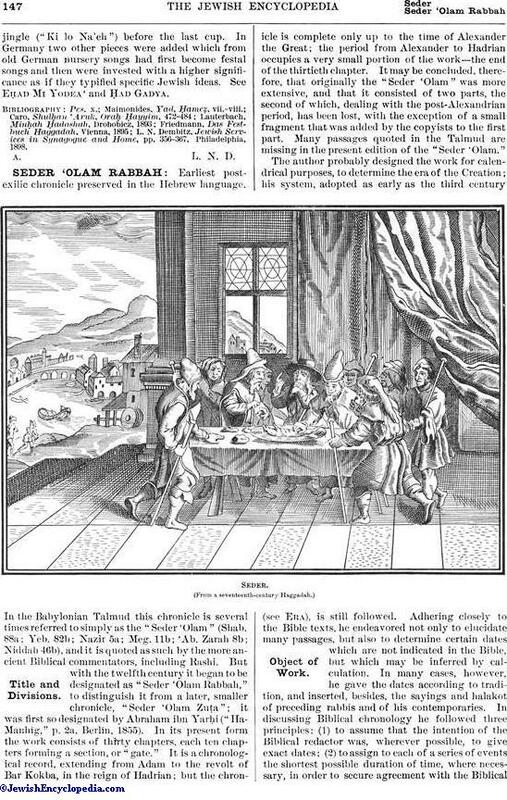 Seder as Observed by Dutch Jews of the Early Eighteenth Century. The term used by the Ashkenazic Jews to denote the home service on the first night of the Passover, which, by those who keep the second day of the festivals, is repeated on the second night. The Sephardic Jews call this service the "Haggadah" (story); and the little book which is read on the occasion is likewise known to all Jews as the "Haggadah," more fully as "Haggadah shel Pesaḥ" (Story for the Passover). The original Passover service, as enjoined in Ex. xii. 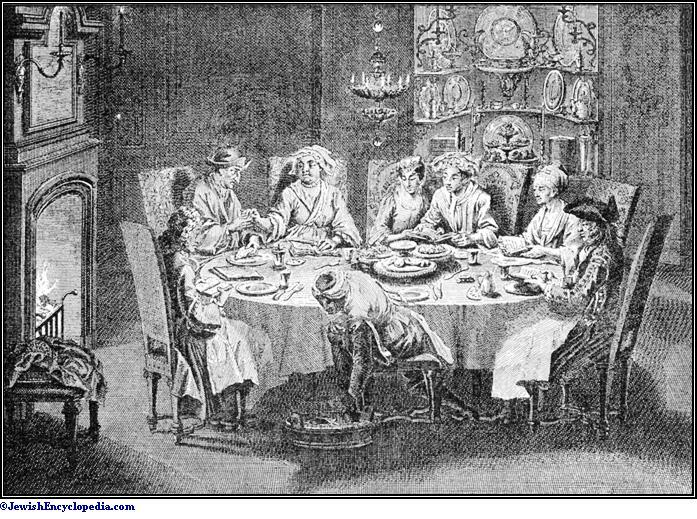 1 et seq., contemplates an ordinary meal of the household, in which man and wife, parents and children, participate. The historical books of Scripture do not record how and where the Passover lamb was eaten during the many centuries before the reform of King Josiah, referred to in II Kings xxiii. ; it is related only that during all that long period the Passover was not celebrated according to the laws laid down in the Torah. In the days of the Second Temple, when these laws were observed literally, the supper of the Passover night must have lost much of its character as a family festival; for only the men were bidden to attend at the chosen place; and the Passover lamb might not be killed elsewhere (Deut. xvi. 5-6). Thus, only those dwelling at Jerusalem could enjoy the nation's birthday as a family festival. 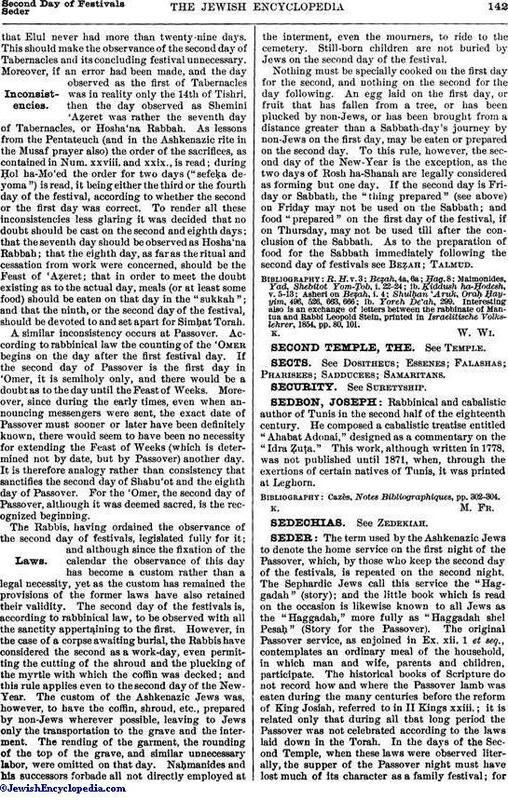 There is no information as to how the night was celebrated during Temple times by the Jews outside the Holy Land, who did not "go up to the feast." The destruction of the Temple, while reducing the Passover-night service into little more than a survival or memorial of its old self, again brought husbands, wives, and children together around the same table, and thus enabled the father to comply more closely with the Scriptural command: "Thou shalt tell thy son on that day." Before the schools of Hillel and Shammai arose in the days of King Herod, a service of thanks, of which the six "psalms of praise" (Ps. cxiii.-cxviii.) formed the nucleus, had already clustered around the meal of the Passover night; of this meal the roasted lamb, unleavened bread, and bitter herbs were necessary elements (Ex. l.c. ; Num. ix. 11). 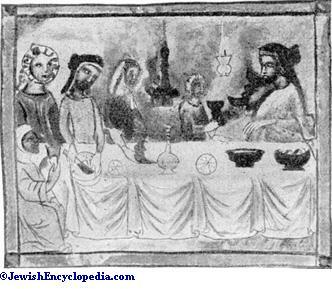 The service began with the sanctification of the day as at other festivals, hence with a cup of wine (See Ḳiddush); another cup followed the after-supper grace as on other festive occasions. 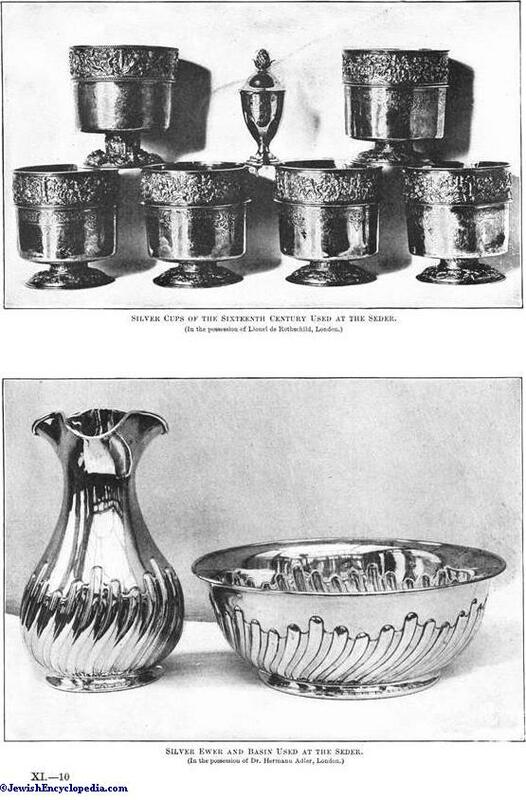 But to mark the evening as the most joyous in the year, two other cups were added: one after the "story" and before the meal, and one at the conclusion of the whole service. The Mishnah says (Pes. x. 1) that even the poorest man in Israel should not drink less than four cups of wine on this occasion, this number being justified by the four words employed in Ex. vi. 6-7 for the delivery of Israel from Egypt. Both in the arrangement of the table and in the psalms, benedictions, and other recited matter the Seder of the present day agrees substantially with the program laid down in the Mishnah. Three thick unleavened cakes, wrapped in napkins, are laid upon the Seder dish; parsley and a bowl of salt water are placed next, to represent the hyssop and blood of the Passover of Egypt; further, watercress or horse-radish-tops, to serve as bitter herbs, and a mixture of nuts and apples, to imitate the clay which the Israelites worked into bricks; also slices of horseradish. 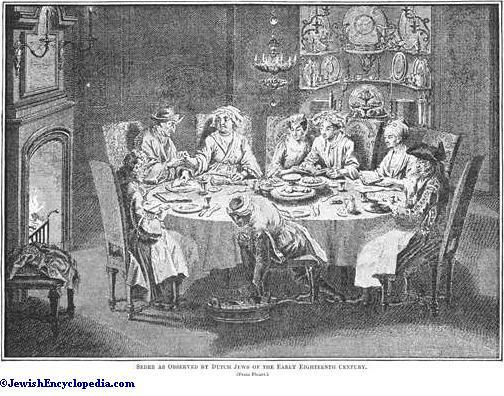 A roasted bone as a memorial of the paschal lamb, a roasted egg in memory of the free-will offering of the feast, and jugs or bottles of wine, with a glass or silver cup for each member of the family and each guest, likewise are placed on the table. It is customary to fill an extra cup for the prophet Elijah. Ḳiddush is recited first, as at other festivals; then the master of the house (as priest of the occasion), having washed his hands, dips the parsley in the water, and, with the short prayer of thanks usual before partaking of a vegetable, hands some of it to those around him. He then breaks off one-half of the middle cake, which is laid aside for Afiḳomen, to be distributed and eaten at the end of the supper. Then all stand and lift up the Seder dish, chanting slowly in Aramaic: "This is the bread of affliction which our fathers ate in Egypt: whoever is hungry come and eat: whoever is in need celebrate Passover with us," etc. Thereupon the youngest child at the table asks: "Why is this night different from other nights?" etc., referring to the absence of leavened bread, to the bitter herbs, and to the preparations for dipping. In the days of the Temple, and for some time after its downfall, there was also a question, "Why is the meat all roasted, and none sodden or broiled?" For this no longer appropriate question another was substituted, now also obsolete: "Why do all of us 'lean around'?" in allusion to the Roman custom at banquets—which became current among the Jews—of reclining on couches around the festive board. The father or master of the house then answers: "We were slaves to Pharaoh in Egypt, and the Lord delivered us thence," etc. This question and its answer are meant as a literal compliance with the Biblical command, found thrice in Exodus and once in Deuteronomy, that the father shall take occasion at the Passover ceremonies to tell his children of the wonderful delivery from Egypt. 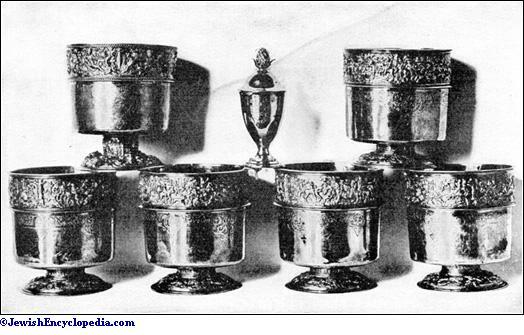 Silver Cups of the Sixteenth Century Used at the Seder. 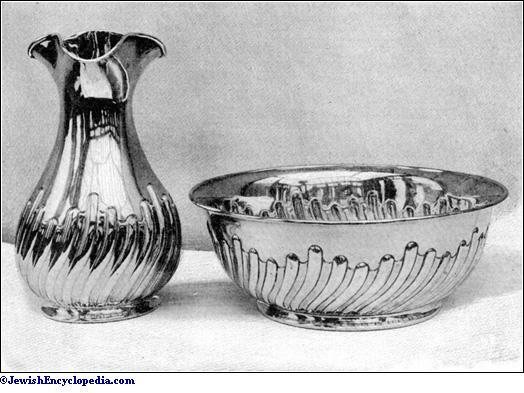 Silver Ewer and Basin Used at the Seder. A number of detached passages in the language of the Mishnah—all referring in some way to the Exodus—follow, introducing Bible verses or commenting upon them, and "beginning with reproach and ending with praise," e.g., the verses from Joshua xxiv. declaring that before Abraham men were all idolaters, but that he and Isaac and Jacob were chosen. The longest of these passages is a running comment on Deut. xxvi. 5: "A wandering Syrian [A. V. "a Syrian ready to perish"] was my father," etc., almost every word of which is illustrated by a verse from some book of Scripture; the comment closing with the suggestion that the last words (ib. verse 8), "with a mighty hand and with an out-stretched arm, and with great terribleness, with signs and with wonders," refer to the Ten Plagues. Further on it is stated that none has done his duty on that night until he has given voice to the three words "pesaḥ" (paschal lamb), "maẓẓah" (unleavened bread), and, "maror" (bitter herb). A more important remark follows, to the effect that it is the duty of every Israelite to feel as if he personally had been delivered from Egypt. Then two of the "psalms of praise" (Ps. cxiii.-cxiv.) are read, in accordance with the teaching of Hillel's school; while Shammai's school read only one of these before supper. A benediction follows, in which the restoration of the Passover sacrifice is prayed for. A second cup of wine is drunk; and with this the first part of the Seder ends, all present washing their hands for supper. 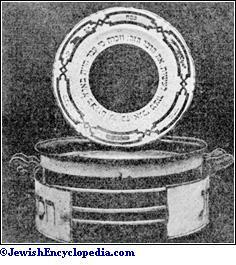 Seder Dish and Device for Holding the Three Maẓẓot. This meal is begun by handing around morsels of the first and third cakes, giving thanks first to Him "who brought forth bread from the earth," and then to Him "who sanctified us by the command to eat maẓẓah." 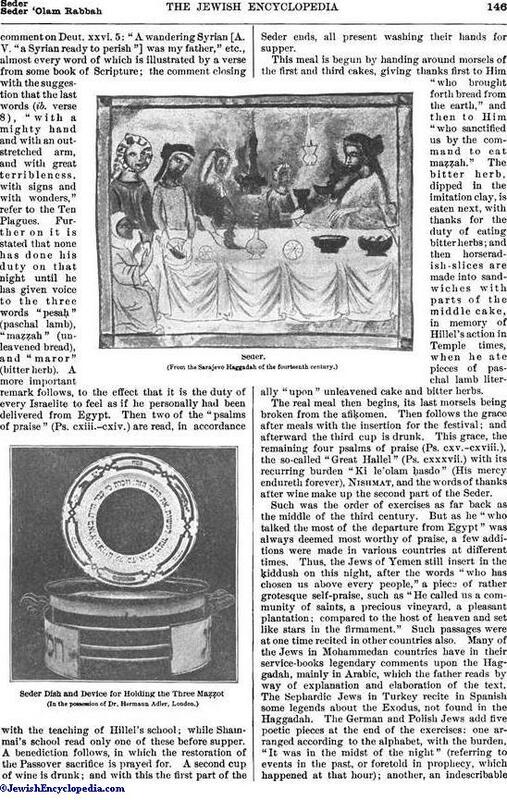 The bitter herb, dipped in the imitation clay, is eaten next, with thanks for the duty of eating bitter herbs; and then horseradish-slices are made into sandwiches with parts of the middle cake, in memory of Hillel's action in Temple times, when he ate pieces of paschal lamb literally "upon" unleavened cake and bitter herbs. The real meal then begins, its last morsels being broken from the afiḳomen. Then follows the grace after meals with the insertion for the festival; and afterward the third cup is drunk. This grace, the remaining four psalms of praise (Ps. cxv.-cxviii. ), the so-called "Great Hallel." (Ps. cxxxvii.) with its recurring burden "Ki le'olam ḥasdo" (His mercy endureth forever), Nishmat, and the words of thanks after wine make up the second part of the Seder. Such was the order of exercises as far back as the middle of the third century. But as he "who talked the most of the departure from Egypt" was always deemed most worthy of praise, a few additions were made in various countries at different times. Thus, the Jews of Yemen still insert in the ḳiddush on this night, after the words "who has chosen us above every people," a piece of rather grotesque self-praise, such as "He called us a community of saints, a precious vineyard, a pleasant plantation; compared to the host of heaven and set like stars in the firmament." Such passages were at one time recited in other countries also. 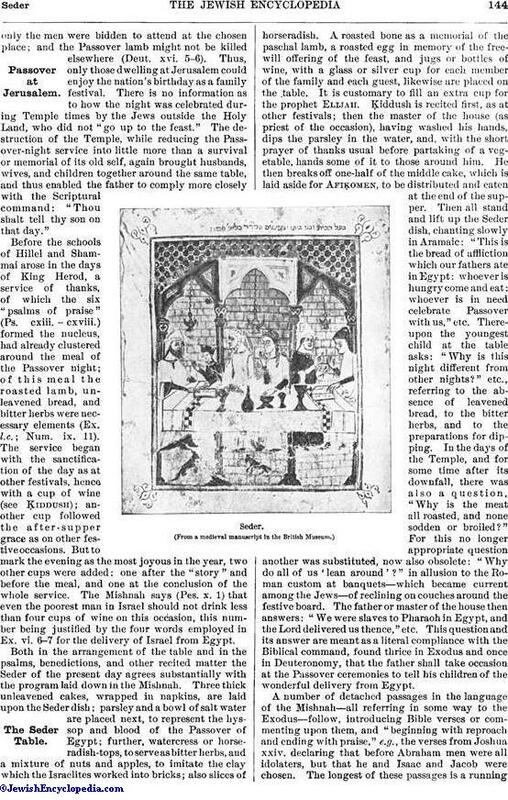 Many of the Jews in Mohammedan countries have in their service-books legendary comments upon the Haggadah, mainly in Arabic, which the father reads by way of explanation and elaboration of the text. 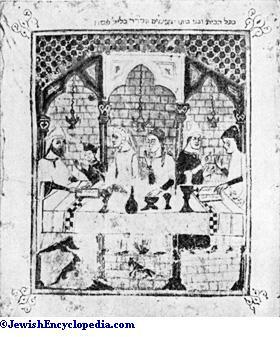 The Sephardic Jews in Turkey recite in Spanish some legends about the Exodus, not found in the Haggadah. The German and Polish Jews add five poetic pieces at the end of the exercises: one arranged according to the alphabet, with the burden, "It was in the midst of the night" (referring to events in the past, or foretold in prophecy, which happened at that hour); another, an indescribablejingle ("Ki lo Na'eh") before the last cup. In Germany two other pieces were added which from old German nursery songs had first become festal songs and then were invested with a higher significance as if they typified specific Jewish ideas. See Eḥad Mi Yodea' and Ḥad Gadya. L. N. Dembitz, Jewish Services in Synagogue and Home, pp. 356-367, Philadelphia, 1898.